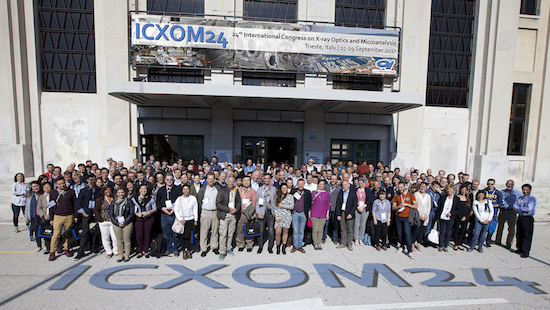 ICXOM24, the 24th International Congress on X-ray Optics and Microanalysis, organized by Elettra Sincrotrone Trieste was successfully held at the congress hall at the Stazione Marittima. of Trieste. The ICXOM conference series is a prestigious international symposium for the discussion of new developments and advances in instrumentation, methods and applications in the fields of x-ray micro- and nano-analysis. This conference series started in 1956 in Cambridge, UK, in response to the need for physical scientists, instrument developers and those using x-ray microscopes and electron probe analysers to come together every three (and now two) years to exchange experiences, learn about new developments in the field and gain new ideas for further research. Following the trend of the last decade, this year conference has focused on synchrotron radiation but developments in laboratory instrumentation are were highly welcome. It covered applications in Life Sciences, Material Science, Earth and Environmental Sciences, and Cultural heritage. The ICXOM24 scientific program included 78 talks, among them 12 were invited and 30 were from young scientists or PhD students. Two poster sessions were organized in order to maximize the scientific discussion and the exchange of ideas and experiences. The scientific discussion among attendees went on for the whole week, conference dinner included, demonstrated by a great participation to the scientific session even in the last day of the conference. The conference included a visit to Elettra Sincrotrone Trieste and Kyma-Undulators that had seen the enthusiastic participation of 95 people. Several institutional and industrial entities sponsored the event. The whole event, where state-of-the-art research was presented, was attended by 270 participants from all over the world. For more information and the book of abstracts, please visit: www.ICXOM24.it. Slides and posters will be soon available on the website. The conference proceedings will be published in "Journal of Instrumentation" for ICOXM24 and in "X-ray Spectrometry" for the MA-XRF workshop.